The Southern Newfoundland Club was formed in response to popular requests to serve Newfoundland owners and enthusiasts in the southern part of the United Kingdom. There were already two excellent Newfoundland Clubs in the UK, The Newfoundland Club (founded in 1886 and one of the oldest Breed Clubs in the world) and the Northern Newfoundland Club (founded in 1984). Obviously, the Northern Newfoundland Club events are held in the North and the majority of Newfoundland Club events, which serves the whole of the UK, tend to be central to the UK. Given the traffic problems, environmental issues and soaring costs of travelling for Newfoundland owners in the south (as evidenced by declining entries), it was felt that there was a genuine and pressing need to offer opportunities for showing, working and welfare in the southern part of the UK. In 2007 there were 1,145 KC Newfoundland registrations but there were only two Breed Clubs. By comparison, many other breeds with fewer registrations have a number of Breed Clubs to serve the whole of the UK. For example, Bernese have five clubs, as do St. Bernards and so on. This added to the compelling argument that a third Newfoundland Club would be both desirable and appropriate. A well-attended inugural Open Meeting was held on 09 February, 2008 in Baginton, Coventry with a view to forming a Club following the Kennel Club guidelines for new Breed Clubs wising to seek KC registration in the future. A Constitution was proposed and adopted and the Southern Newfoundland Club was born with appointments of our Chair (Hedd Richards), our Hon. Secretary (Rachel Hutchinson), our Hon. Treasurer (Robert Hobbs) and Committee Members. The Club was delighted to appoint and welcome as our President, Mrs Pamela Cross-Stern. Pamela has spent a lifetime in dogs, both in showing and judging at the highest level. She has also been actively involved in many KC activities. The Club has been incredibly well supported with our membership approaching 300. While primarily focused on the south of the UK, our membership is by no means geographically exclusive. We are delighted to include members from all over the UK (and overseas!) and in turn many of our members are also members of one or both of the other two UK Newfoundland Breed Clubs. 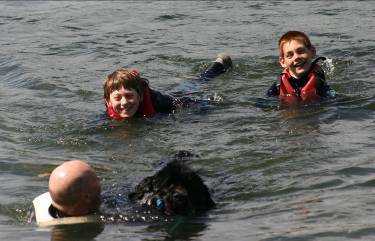 The inter-club membership and co-operation at all levels is a hallmark of our intentions to work for the benefit of Newfoundlands and their owners, wherever they may live. The SNC ran five very successful events in 2008, one being an introduction to Water & Carting, the second being three levels of Water Tests, the third being a Draught Test, the fourth a 'Fun Day' where we aimed to place the emphasis on encouraging our younger members (and with proceeds in aid of Southern Newfoundland Club Welfare) and the fifth a health seminar which was held in November with guest speaker Dr. Sue Gregory BVETMED, Phd, DVR, DSAS (Soft Tissue), Fhea, MRCVS who spoke on Gastric Torsion (aka Bloat). In our second and subsequent years the number, size and variety of events we have organised has grown and we have a large number of members to thank for their wonderful efforts and hard work in putting together and running those events and tests. At the end of April 2009, the club received the official confirmation from the Kennel Club of our registration and recognition as a UK Breed Club. This was a significant milestone in the Club's history and enabled us to hold our first Open Show on 19 December 2009. We have held successful Open Shows each year since and are actively seeking approval from the Kennel Club to hold a Championship Show. The Committee, Officers and volunteers of The Southern Newfoundland Club are totally committed to the success of the Club, and to ensure that work will continue with research into the health issues relating to the Newfoundland breed. It is a priority of the Club to encourage and enthuse our junior members and to work to preserve the working instincts of our exceptional breed. "It is a pleasure working with a Committee and volunteers that are so totally committed to the breed and the Club. In particular, a special thanks must go to our original Hon. Secretary, Rachel Hutchinson, who has worked so hard during the 10 years since it's inception. I would like to thank all the members of the Southern Newfoundland Club for all the help and support you have offered, and look forward to a bright and happy future."